Do you want to allow user registration on your WordPress site? You can expedite the process by creating a user registration form in WordPress that allows users to fill in the necessary information themselves. In this article, we’ll show you how to create a user registration form as well as how to stop the spam registration problem. Organization: When you allow users to request access to your site, you have a recorded entry of all the important details needed to create their account. Customization: You can control what information you need before creating an account for new users, like including their website address as a requirement. Security: By requiring new users to submit a form with activation requirements, you will keep your WordPress site secure and stop user registration spam. Permissions: You can specify what level of access users that complete the form will have on your website. Membership Sites: You can create a membership site using one of the best WordPress membership plugins on the market and require people to register as a member using a registration form. If you prefer written instructions, continue reading below. Next, go to WPForms » Addons and find the User Registration Addon. Install and activate the User Registration Addon. 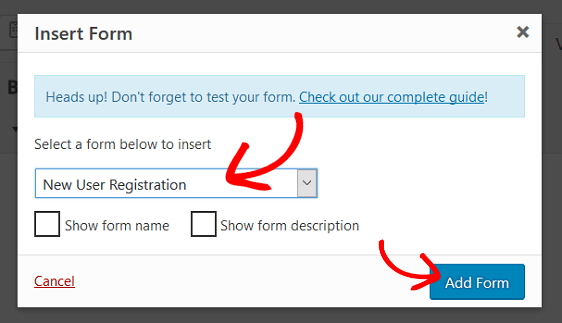 Once your WPForms User Registration addon is active, go to WPForms » Add New to create a new form. 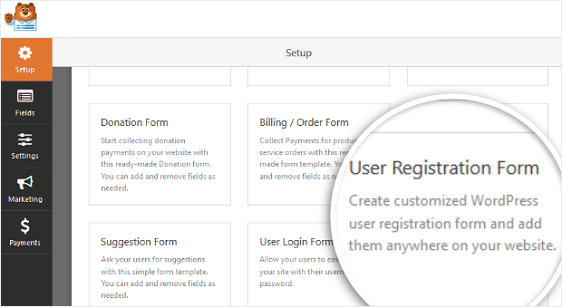 On the setup screen, name your form and select the User Registration Form template. WPForms will create a simple user registration form. Here, you can add additional fields by dragging them from the left hand panel to the right hand panel. Once you’re done customizing your form, click Save. Now we’ll take a look at how to configure the user activation settings so you can prevent spam registration and fine-tune other options to your needs. 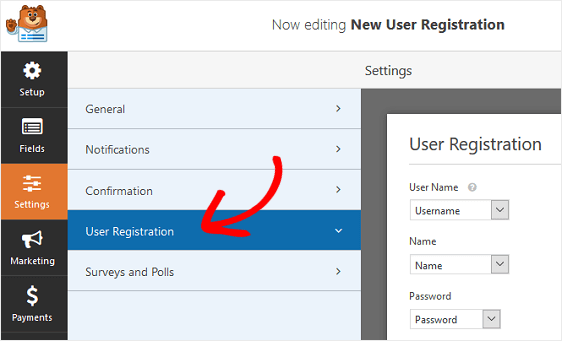 To start, click on the Settings tab in the Form Builder and then click on User Registration. In addition, you can select the Enable user activation checkbox if you want users to confirm their email to activate their new account with you. This will help prevent spam user registrations and require all new users to complete their registration using the link in the email. Since spam registration is a huge problem in WordPress, we highly recommend enabling this option. If you select the Manual Approval method, site admins will need to approve each user before they can log in. This can be time consuming, but some people prefer it. Once you’re done configuring the user registration settings, click Save to store your changes. Notifications are a great way to send an email whenever a new user account is created on your website. In fact, unless you disable this feature, whenever a new user registers on your site using the User Registration addon, you’ll get a notification about the new account creation. However, if you use smart tags, you can also send a notification to the user when they create a new account with you. This will let them know they successfully created a new user account. If you want to keep your branding consistent across all your emails, giving a more professional impression to your new users, check out this guide on adding a custom header to your email template. Form confirmations are messages that display for customers once they submit an order form and are a great way to let people know their account has been created and what the next step is. This is especially helpful if you require users to confirm their user account via email because you can display a message thanking them for registering and let them know to check their email for the next steps. Message. This is the default confirmation type. When a user completes your registration form, a simple message confirmation will appear letting them know their form was processed. Look here for some great success messages to help boost customer happiness. Show Page. This confirmation type takes users to a specific web page on your site thanking them for registering. For help with this step, check out our tutorial on redirecting customers to a thank you page. In addition, be sure to check out our article on creating effective Thank You pages for boosting customer loyalty. Go to URL (Redirect). This option is used when you want to send customers to a different website. 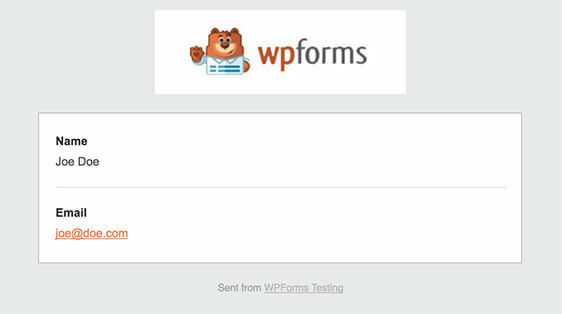 Let’s see how to set up a simple form confirmation in WPForms so you can customize the message users will see after submitting a user registration form in WordPress. First, click on the Confirmation tab in the Form Editor under Settings. Then, customize the confirmation message to your liking, and click Save when you’re done. For help with the other confirmation types, see our documentation on setting up form confirmations. Now you’re ready to add your user registration form on your site. You can combine your site’s user registration forms with our email marketing addons like MailChimp, AWeber, Campaign Monitor, and GetResponse. This allows you to automatically add all registered users to your email marketing list. You can even add them into various marketing automation sequences from there. In addition, you can configure your user registration forms to accept payments using our payment addons Stripe and PayPal. This is perfect if you want to run a membership site, require user registration, and want to accept payment right away. To configure the payments settings on your user registration form, you’ll first have to install and activate the right payment addon. 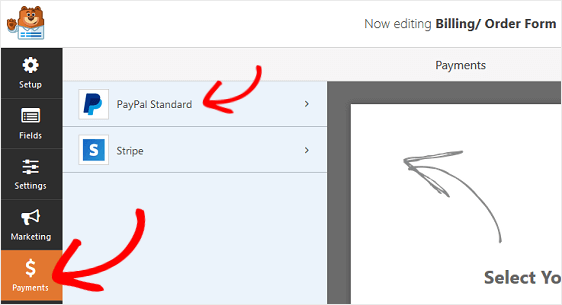 For easy step by step instructions, check out our tutorial on installing and using the PayPal addon. If you want to use Stripe, you’ll find similar instructions for installing and using the Stripe addon here. Once you’ve done that, click the Payments tab in the Form Editor. In our example, we’ll set up PayPal to process orders. 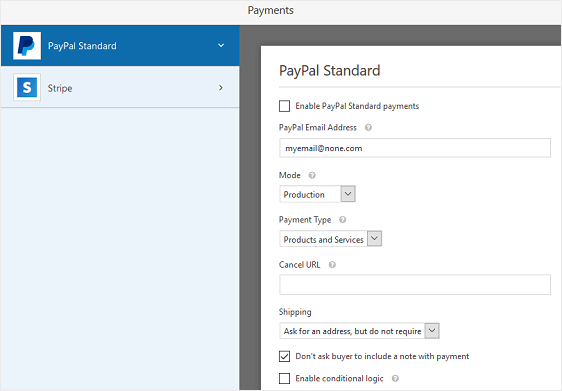 Here you’ll need to enter your PayPal email address, select the Production mode, choose Products and Services, and adjust other settings as needed. After you’re done configuring the payment settings, click Save to store your changes. Be sure to check out our tutorial on allowing customers to choose their payment method if you want to offer more than one payment option. 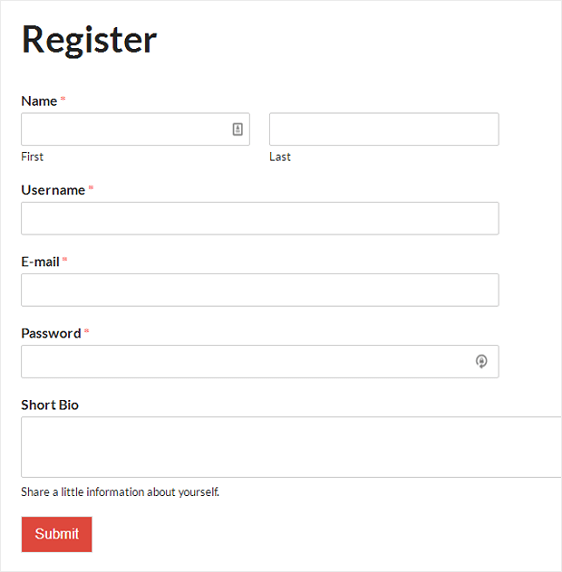 Now you’re ready to add your user registration form to your website. After you’ve created your user registration form, you need to add it to your site. WPForms allows you to add your forms to several locations including your blog posts, pages, and even as a sidebar widget. Let’s take a look at the most common post / page embed option. Start by creating a new post or page in WordPress and then click on the Add Form button. Next, select your user registration form in the modal popup and click Add Form. Lastly, publish your post or page so your user registration form will appear on your website. And there you have it! 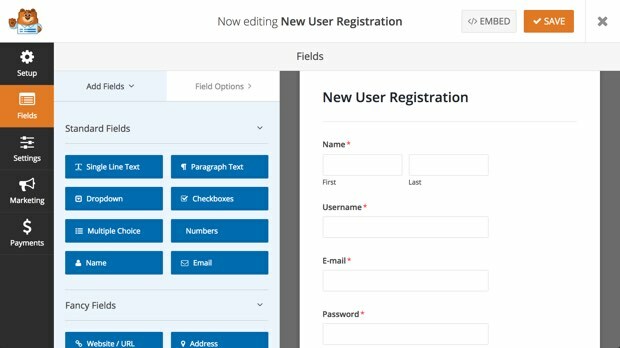 You now know how to create a user registration form in WordPress. If you want to automatically log new users into their newly created account, rather than show them a thank you message after registering on your website, check out this article on how to set up WordPress registration redirects. how can i add a accept terms and condition radio button? You can add radio buttons to your forms by clicking on the Multiple Choice field (or dragging and dropping it onto your form). For a terms and conditions question, however, a checkbox would probably be a better choice if you’re requiring users to agree to the terms. That’s because you can set fields as required, but there’s no way to set a specific answer as required. In other words, if you created yes/no radio buttons that were required, it would still let the user submit the form whether they choose “yes” or “no.” So, you may want to set a checkbox as required instead. That way, the user has to check the “accept terms and conditions” checkbox in order to submit the form. Great question! WordPress.com does not allow the installation of plugins by their users. This is one of quite a few differences between WordPress.com and WordPress.org, which can be really confusing given their very similar names (if you’d like a full comparison between the two, you can check out this article). If you’d like to consider switching over to WordPress.org (where you get a lot more controls, such as the ability to install plugins), you might want to start by checking out this tutorial. It will walk you through all of the necessary steps, the biggest of which is generally finding your own host (since WordPress.com includes hosting for you, but .org does not). is possible to add special fields like complete address or others? In other words, to choose all fields appart of name, email and password in that registratio form. Can register users edit their profiles? If we add a new field in the registration form next month, the user data will keep intanct? It is definitely possible to add custom fields like those you mention, and we just recently published a tutorial on how to do that. Our User Registration addon does not provide an interface to manage or edit existing users and focuses solely on the account creation process, so if this is a critical feature you might consider a full-blown membership plugin option. As to your last question, if you add a new field later (for example, if you set up basic user registration now and then add custom fields next month using the tutorial I shared above), it won’t hurt any existing user profiles. These new fields will just be blank for those older profiles unless you go back in any manually fill them in. Is it possible to create a user edit form using WPForms? I have signed up to Pro deal but without this I will probably need to use a different plugin. I’m sorry, but I’m not sure that I understand your question – but we’d be happy to help! Could you please contact us in support with some extra details about what you’d like to be able to do? Hello, i need a form to save only the datas of customers without creating a login account. Is that possible? Yes, this is absolutely possible! While we wouldn’t recommend collecting any sensitive details, such as a password, in a non-registration form, you can collect all sorts of other information in other types of forms. I would suggest starting by creating a form with all of the fields you want. Then if you want, you can also add ways to collect hidden data from customers (there are some additional options similar to that discussed here as well). Can the “Activation Required email” be edited so that I can remove the /wp-login from the url address? Only because the user will go to the backend of the site. We don’t have a built-in way to accomplish this. However, we can modify the login URL included in this email with some custom code. In order for us to help you with this, would you please contact us in support? Hi – How do you associate a newly created WPForm new user registration as the default WordPress/WooCommerce user registration form ? We aren’t able to support integration with WooCommerce, as their service is deeply built around their own forms and very custom setup. However, if you’d like to redirect regular WordPress user registration for your site I found a tutorial on that here. I don’t have a WordPress account. is it possible to install wordpress on the SITE i have with another HOST COMPANY? if possible please direct me on how to do it. Also is it possible to direct these forms i created with WordPress to my own DATABASE? Sure! WPBeginner has a great step by step tutorial on installing WordPress here. Some hosting providers have WordPress-specific hosting (these will generally install WordPress for you), but this isn’t necessary. Once the paid version WPForms is installed within WordPress, it will automatically start storing your form entries to your site’s WordPress database. For more details on our licenses, you can check out our pricing page. I want to provide a Social Login to my end users. While they do this, usually their Full Name, E-mail Address, Profile Picture, etc. is automatically brought in and a default User Name is created. I then want to provide them a feature to view / edit what has come in, and add additional fields such as Phone number, Newsletter subscription preferences, etc. What is the right set of Plugins and sequence for this? We don’t currently have any social integration available for registration or login. I agree this would be useful, though, and I’ll add it to our feature request list so our team can consider it down the road. also, i want all their data to go into my database and i should be able to view it and edit it on my wordpress as an admin. Thirdly i want the users to be able to edit their profile. What is the right plugin to use or tutorial? Sure, you can set confirmation settings to redirect to a specific page upon form submission. Additionally, our User Registration addon will send all profile details to the native WordPress users datatable — so you can edit user profile info in the same way as any other user (under Users in the left admin menu). Because users will be added to the native Users table, they’ll also be able to edit their own profiles through the admin area (if your users have Subscriber roles, this is generally the only item they can see in the admin area). In case it helps, here’s WPBeginner’s tutorial with more details on user roles. 1/ It is compatible with woo commerce account ? If a user register with wpforms we can give him the customer role and he has just 1 account woo commerce ? We just replace basic woo commerce form with a custom wpforms form ? I’m right ? When a user register with fees, it’s for 1 year. The next year we need to send him reminder to pay again. We don’t currently have an option for subscription payments available, however this is on our list to tackle soon. Additionally, we don’t currently support any integration with WooCommerce, mainly because they’re heavily integrated with their own forms systems. If you’re using our paid plugin, all entry data will be stored by default to your site’s database (here’s our article with a bunch more details on database storage). And if you’re using WPForms Lite, entry details are stored only in the form’s notification email. Hi, I need to modify the validation mail send to validate the email adresse. Can it be done? If it isn’t possible, can I translate this in dutch? Sure! To change the content of this email, you’ll just need a little code. You can find this code, as well as all the details about how to use it, in our developer doc. This plugin is exquisite and very easy to use, thank you very much for all your effort. I would like to suggest a feature to add an avatar (by uploading my own picture) in the registration form, or at least the possibility of integrating third-party plugins, such as WP User Avatar. On the other hand, is there any way to delete a default form field? For example, if I add the “Address” field, my form shows two fields at the top: “address line 1” and “address line 2”. But the thing is I don’t want the actual address at all, I only need the city and the countries drop-down list. Is that possible? Thanks in advance for any feedback you can provide me and keep up the good work! The best way to let users add avatars is to use Gravatar, which is what’s used by WordPress comments that allow user photos (in most themes). For example, my image for this comment is being pulled from Gravatar (and if you scroll around in these comments, you’ll see a few other users have images also — these are also coming from Gravatar). For more details on why Gravatar is useful, and how to set it up, here’s a tutorial from WPBeginner. For your other question, the best approach will be to simply add two fields: a Single Line Text field for the city, and a Dropdown field for the country (if you use our Bulk Add tool, this is super easy to set up). It’s definitely possible to map form fields to custom fields in other plugins, however with membership-type plugins it’s generally best to use the registration form they provide (they usually have a bunch of code built into the form that’s required for things to function properly). Nice work… But I have one question…. Can I create a registration form for a user to create other users? A system where one user logins in and creates accounts for other users. Great question, however what you’re describing is limited by WordPress user roles. By default, WordPress only allows the Admin user role to create new users (for more details on WordPress user roles, here’s a tutorial from WPBeginner). This is important, as the ability to create users (which includes additional admin users) provides a lot of power within the site. This is also why our user registration form is super helpful — it lets users register to your site, but still leaves you with a ton of power over how this works (what role they’re assigned, the option to approve users, etc). can we add maps and payumoney payment gateway integrated to the premium wp forms? We don’t currently have the payment integration you mentioned, though I’ve noted that on our feature request list for future consideration. For now, we’re focusing on our Stripe and PayPal payment integrations. For maps, you can add maps to a form with any paid license through the HTML field. Here’s out map embed tutorial with more details. It may be possible to use WordPress for this, however I’m not familiar with any part of what would be needed — and that functionality falls outside of our support scope. If you have any additional questions about our User Registration, though, please feel welcome to reach out to our team. If you have a WPForms license, you have access to our email support, so please submit a support ticket. That way we can discuss more details and investigate this further. If I’m understanding correctly, it sounds like you’re looking for a recurring/subscription payment option. We don’t currently have a way to do this, though development is underway for this option for our Stripe addon (no ETA on that yet). I’d like to synchronize a bank verification code with the form. Reason: I am asked by my affiliate bank to generate codes for applicants who wants to register for a program that my blog is the official media partner. The code (when generated and sent to the bank) will serve as their login user name while they generate their password. Please, I need assistance, as the codes has to conform with those given to the bank, any malicious attempt to impute another unrecognized code should be denied. Thank you in anticipation of a favorable answer. I apologize as I’m not sure I understand exactly how you’d like this to work. When you get a chance, could you please get in touch with our support with some extra details about what you’re looking for? Is this plugin compatible for WooCommerce ? i am looking for same plugin for woocommerce like this one here [URL removed]. This one is costly for me and i want to buy in cheap rate. Excellent and A wonderful read! Your article is the best one I have learned, and it has helped me. Keep doing that. Pre-purchase question. Is it possible to list the entries along with all the information gathered from the registration form on a list in front-end? We don’t have a built in way to display entry details like this, though it’s on our feature request list to consider down the road. And in case it helps, you could check out this code from one of our developer docs to see if that could fit what you have in mind. In order to make sure we answer your question as thoroughly as possible, could you please contact our team with some additional details about what you’re looking to do? Is it possible to add a qualifying question people must answer correctly in order to sign up? I.e. there is a promo code in a TV ad they must enter. Thanks. Our new Form Locker addon sounds like it would be a good fit here. Within the Form Locker addon, you can enable a passcode for a form — and the user would have to enter a specific code/password in order to access the form. So in this case, you could use this option to require a specific promo code before the form can be accessed. If you’d like to check out more details, here’s our Form Locker addon tutorial (this link will specifically go to the section on how to require a password). 1. User click submit, they will auto-receive a mail containing activation link. 2. User click the activation link, they will auto-receive another email containing some text to ask them to reply the email with an attachment. 3. On my end, I’ll only receive the lead only when the user complete the 2nd step. We don’t currently have a built-in way to do this (outside of sending the user an activation link). However, you should be able to accomplish most of what you’ve described with a combination of our built-in user registration functionality and some custom code shared over in our developer docs. The extra code would allow you to send a follow-up email after the user is activated (so in this case, after they click their user activation link). We plan to have agents recruit users for our site. We would like an agent to start the user registration process by signing in to our agents area and partially filling in a registration form on behalf of the user. The user would then receive an authentication email that would link them back to their user registration form so that they can complete registration and select their service options and make payment these actions would complete the registration process. Is it possible to handle a partially completed form (required fields etc). Or will it be two forms and a php script to combine them? We don’t currently have a way to save a partial entry and continue later, so the user would need to submit two separate forms. There are some other items here that might be better discussed in more detail, though — if you’d please submit a ticket when you get a chance we’ll be able to better assist from there. To disable this email, you’d need to open the form builder and go to Settings > User Registration. Within those settings, you’d need to uncheck the box labeled Enable user activation. This will register users right away when they submit the form. Thank you for your wonderful work for *us*!!! In our forms, you can choose what the user sees after they submit the form. By default, they’ll see a confirmation message — but you can choose to redirect them to a different page if you’d prefer. For more details, here’s out tutorial on setting up form confirmation. Is there a way to embed a registration button in a gallery at the top of a page – rather than having to scroll all the way to the bottom of the webpage? Hi Sam — I apologize, but I’m not sure I understand your question (I’m not sure, but it sounds like what you have in mind might be specific to the theme you have installed on your site). When you get a chance, could you please get in touch with some additional details? We’ll be able to better assist from there. Hi, I want to create a form for quote, clients can list name, email, phone and have option to upload a flyer to print, and can say how many copies, and if color or black and white. I would like for clients to be able to create accounts, make orders and be able to return and see order history and to be able to reorder same item if they wish. Is this possible? Our forms can definitely be used to create a quote form with the options you mentioned, including uploading a flyer file — and they could place an order as well. Further, you could use our User Registration addon (described above) to let them create a user on your site. However, we do not currently have advanced ecommerce features such as displaying an order history or providing an option to reorder (outside of filling out a regular order form). I it possible to open this form on popup just like in bootstrap modal ? Hi Asim – Yes, our forms can be displayed within any popup or modal that accepts shortcodes. In case it helps, here’s an article from WPBeginner reviewing some of the top popup plugin options. I’m wanting to create a page where users can register on my website, then have access to a page where they can fill in a form, check some boxes and then have this information displayed on my website. I hope that makes sense. I’d like them to be able to log in, add, update or delete information. I don’t want them to be able to do anything all all to the rest of the website – just be able to manage their own page(s). At the moment we’re not able to display information that is submitted via our forms onto a page so I apologize for the inconvenience! In terms of allowing users to register, you can create a page where users can register for your site using our User Registration addon. Once they’ve registered, you’ll be able to create a login page for them to access the site. The parts that they will or won’t be able to access will depend on their user role. Probably a dumb question but how do I create a simple logout form? I have both a login and registration forms built but I can’t figure out how to create a form that let a user log themselves out of the site. Currently we don’t have an option to create a custom logout form but depending on what you’d like to do, you can try this workaround to manually add a WordPress logout link to your site. Hi there, I’ve used your plugin before for conditional forms and loved it! You mention one of the benefits is: “Permissions: You can specify what level of access users that complete the form will have on your website.” …. … … I want users to have to fill out a form before they can see the jobs section of a website. Is that possible? Furthermore, will the website remember them when they return, so they won’t have to log-in/re-register to browse the jobs page again? You can create a form that will redirect users to a hidden page upon submission. I would recommend checking out our article that goes over how to do this. In regards to your second question, the website won’t remember them unless they’re already logged into your site. Otherwise, they’ll need to log in again. hello, how can i design registration form , after submitting , result show to user in pdf. I’m afraid I don’t quite understand your question but while you can’t send automatically send a PDF copy of a form entry, you can send a copy of the submitted registration form to the user by adding in the smart tag for your form’s email field in the “Send to Email Address” field of the form’s notifications settings. How can you do this without a plugin? I’d recommend checking out this helpful guide from WPBeginner showing you one way to allow users to register and log into your site without the use of a plugin. Is there a possibility to force login users after submitting user reg form? Does WPforms have an own USER PROFILE/PAGE addon? We don’t have the ability to do this right now but I’ve made a note on our feature request list so we can keep it on our radar! Thanks for the suggestion. In regards to a user profile/page addon, we currently don’t offer such a feature – once a user registers for your site and logs in, they’ll be able to view their own user page within the WordPress dashboard.